We’ve covered the basic functions of the Finder from stem to stern. It’s now time to delve into the Mac OS’s system preferences. Like the control panels on Windows PCs, system preferences govern much of the behavior of the Mac OS and the Mac’s peripherals. To begin your explorations, click the Apple menu in the top-left corner of your Mac’s display and choose System Preferences. Optionally, click the System Preferences icon in the Dock. When the System Preferences window appears, you’ll see that the items within it (which are called preference panes or pref panes, but I sometimes refer to simply as preferences) are grouped in categories, such as Personal, Hardware, Internet & Wireless, and System. If you’ve added third-party preference panes, they will appear under the Other heading. The Personal system preferences focus largely on the look and feel of the Mac OS in addition to security settings. Hardware preferences relate to, well, your Mac’s hardware as well as peripherals. Internet & Wireless includes preferences for Internet and network connections, as well as Wi-Fi and Bluetooth settings plus a Sharing preference for choosing what services your Mac will and won’t share with other computers. Finally, System is a category that Apple created seemingly to throw together preferences that didn’t fit in Personal, Hardware, or Internet & Wireless. 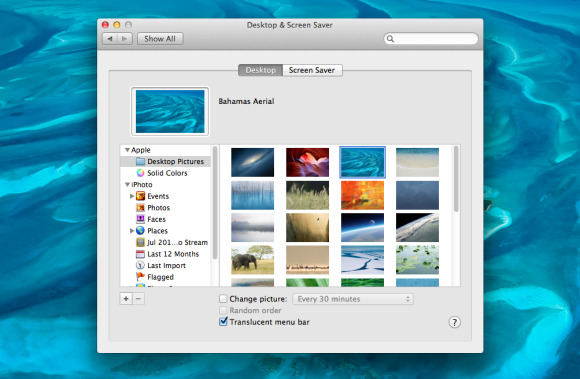 We’ll start with the General and Desktop & Screen Saver preferences that appear under the Personal heading. The General preference consists of four sections. The first governs the look of buttons, menus, windows, text highlights, and sidebar size. Colors and icons: The Appearance pop-up menu lets you choose the color of buttons, menus, and windows. Regrettably, you have just two choices: Blue and Graphite. You’ll see these colors reflected in active buttons (meaning the colored-in buttons that you can activate by pressing the Mac’s Return key), menu title backgrounds, and selected window headers (Name, Date Modified, and Size, for example). When you highlight text, that highlighting is blue by default. If blue makes you blue, click the 'Highlight color' pop-up menu and choose a different hue. If you choose Other, you will meet—perhaps for the first time—the Mac’s Colors window. Here you can select colors from a color wheel, play with color sliders, choose colors from a variety of palettes, select colors from a spectrum display, and, my favorite, pick a color from a box of virtual crayons. (Click some of the colors to learn their Crayola-inspired names.) Additionally, if you click the Magnifying Glass icon, your Mac’s pointer turns into exactly that. You can then hover that icon over anything displayed on your Mac and, with a click, choose the color of whatever the pointer is zeroed in on. The 'Sidebar icon size' pop-up menu is self-explanatory. 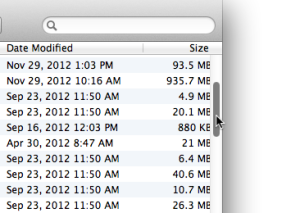 Choose from Small, Medium, and Large sizes for the icons that appear in Finder windows’ sidebars. 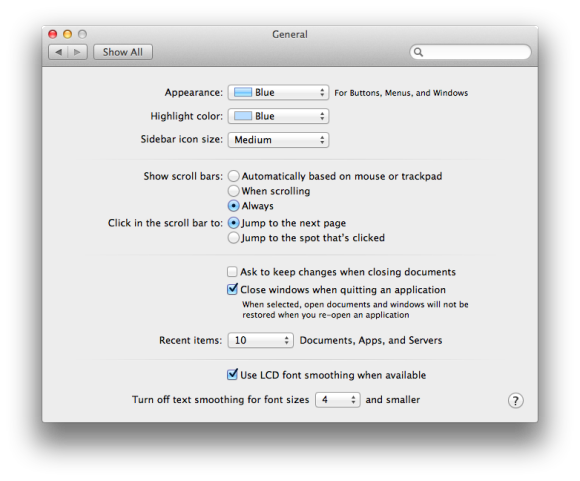 Scrollbars: If you’re new to the Mac with Lion or Mountain Lion, you may not be aware that at one time the Mac’s scrollbars were always visible. They contained not only blue bars (called thumbs) that you could drag up and down to scroll through a window, but also small arrow buttons that caused the window to scroll in small increments with each click. Those arrow buttons are gone, as are the blue thumbs, though scrollbars remain. Those scrollbars now display gray thumbs—sometimes. And the sometimes is what counts in the 'Show scroll bars' setting. If you enable the first option—'Automatically based on mouse or trackpad'—the scrollbars will always show when you use a mouse with your Mac. This is the Always item that you see in the list of options. If you use a trackpad instead, scrollbars will show only when you place your pointer within a window that should show scrollbars, and manipulate the trackpad. Do this, and the scrollbars appear and then fade away once you stop dinking around with the trackpad. This is the 'When scrolling' option that appears above the Always option. One advantage of choosing the Always option is that you can easily click and drag a scrollbar’s thumb to rapidly scroll through a window. Also, thumbs are sized proportionally to the number of items in a window. For instance, if all the objects in a window are showing, you’ll see no thumb on the right side of the window because you have nowhere to scroll to. (You may see a thumb on the bottom of the window, however, because you can scroll to the right to see more information about the files within the window.) If a window has hundreds of items, you’ll see a small thumb, which indicates that you can scroll the window quite a bit before you reach the end. You can also configure the behavior of the scrollbar when you click in it. The default setting is to jump to the next page when you click anywhere in the scrollbar. 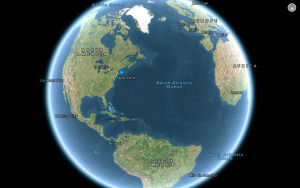 Optionally, you can configure it to jump to the spot that you clicked. You might like this option if, for example, you routinely work on long, multipage documents, and you want to move to the beginning, middle, or end of your documents with a single click.